Saddle up readers for the first Wednesday Western Round-Up! Every Wednesday I’ll be featuring two or three Westerns (current releases or classics) that I’d recommend for any trail! And this week Cookie will be stickin’ his hand back in the hat for a special giveaway, so read to the end to see how to get your name in the hat! Now, don’t misunderstand I’m not a professional reviewer, but if I had saddles to give away I’d give each of these authors FIVE. My comments appear after the official book blurb. Enough of my jawin’ here’s the good stuff! I had to start with one from the master of Westerns, Louis L’Amour. And HONDO? Big SIGH! I’d not only say this is one of my favorite Westerns, but one of my favorite Western romances. The book blurb describes Hondo to a T. He enters the pages carved from the land he travels. A true man of the West. And his dog Sam is just as weather beatin’ and as much a loner as the man he follows. Angie Lowe is a strong woman alone and raising her son in a harsh land after her husband runs-off. She’s a self-sufficient Western woman and isn’t looking for a man to save her, but doggonit it sure is nice when a man tough enough to do the job comes along. :o) And after the kiss Hondo plants on her as he’s leaving, you bet your boots he crossed her mind long after his horse disappeared into the distance. He did his share of thinking about her, too. Which was really one of the most poignant things about this book is how through everything they cross each others minds (and hearts). Of course, in true L’Amour fashion there’s plenty of action, fistfights, gunfights and a battle between the U.S. Army and the Apaches. But for me it was made all the better for the personal stories of survival for both Hondo and Angie and the love story woven throughout. Oh! And the scenes with Hondo and Angie’s son are priceless! 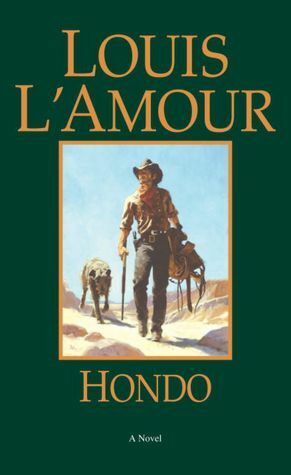 All right, I’m going to list a few Louis L’Amour books I would recommend. This isn’t even a grain of sand in the desert that is Louis L’Amour’s collection. So post your favorite! Gem is an author who never disappoints, and A PINCH OF NAUGHTY is no exception. Cyrus is a hawt cowboy hero, but he’s also intelligent and earned everything the hard way. His strength of will is what earns the respect of others (or terrifies them). And when he’s not imposing his will, he’s charming your bloomers off. Eleanor is the perfect Eastern born heroine to light a fire under Cyrus’ boots. She’s every bit as intelligent, stubborn, determined and not afraid of earning her own way. Like Angie, in HONDO, Eleanor doesn’t need a man to save her, but she’s not a fool who won’t accept some help when it comes in the form of a tall drink of water cowboy. :o) Oh, and just so you know, the love scenes are hotter than Eleanor’s oven! Don’t forget Gem’s Eclipse Series! They’re all treasures for sure. I have to give a special hoot and holler for PERFECT STRANGERS. A fabulous story from beginning to end with characters you won’t forget. Others in the Eclipse Heat Series: QUINCY’S WOMAN and FIVE CARD STUD with BREED TRUE and WOLF’S TENDER coming soon. YEEE HAW!! AS A SPECIAL TREAT, GEM HAS GRACIOUSLY OFFERED TO GIVE ONE COMMENTER A COPY OF “A PINCH OF NAUGHTY” ALL YA HAVE TO DO IS LEAVE A LITTLE ‘OL COMMENT ON THE BLOG AND YOUR NAME GOES IN COOKIE’S HAT!!! Howdy! Welcome to the first gathering around the campfire. 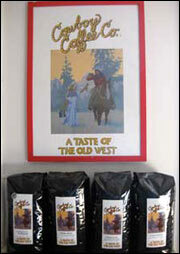 Shake off the trail dust, grab a cup of Arbuckle’s from Cookie and join me. But remember take off those spurs before you squat down, many a cowboy had a rude awakening who didn’t. 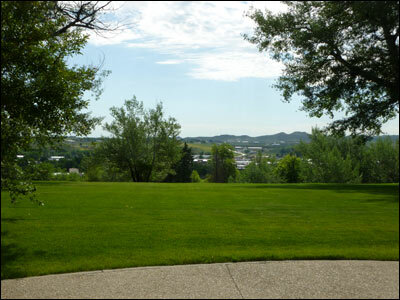 This being the first post I thought I’d pay tribute to the people who settled in one of my favorite towns in the West, an area that serves as the backdrop for most of my stories, Sheridan, Wyoming. And since I write about romance, I chose a couple who epitomized the indelible spirit of the land they settled on and a true romance. Orphaned at a young age, John B. Kendrick (born in Texas, 1857) was raised by relatives until he struck out on his own at the age of fifteen taking his first job breaking horses for room and board. In 1879, the twenty-two-year-old hired on with the Snyder-Wulfjen Brothers of Round Rock, Texas to move a herd of cattle from Matagorda Bay on the Gulf of Mexico to the grass lands of Wyoming. On the trail, Jack Kendrick experienced the worst the open land had to offer: drought, flood, storm and stampede. Anything at night almost, a stumbling horse, the odor of some wild animal or a blinding flash of lightning would start the herd to running. Then the cowboys would have to follow. Sometimes the cattle would run until morning. Or they might stop now and then for a few minutes. Whereupon, of course, we would halt with them, the rain meanwhile coming down in torrents and the night being so black that nothing could be seen but the electricity on our horses’ ear or the lightning wriggling over the ground like illuminated serpents. But the greatest threat to Jack was pretty seven-year-old Eula Wulfjen who crawled upon the lanky cowboy’s lap and proclaimed she intended to marry him just as soon as she was old enough. True to her word, in 1891, after years at finishing schools in Colorado and Texas nineteen-year-old Eula married thirty-four-year-old Jack. When they married, John Kendrick was no longer living on cowboy wages. Like many of the cowboys with whom he rode, Kendrick’s formal education ended after the fifth grade. Unlike many of his fellow cowpokes, Kendrick continued his lessons on the trail and during roundups. Instead of gambling and drinking, Kendrick spent his spare time reading and studying from books he carried in his saddle bags. Kendrick bought a few head of cattle with his cowhand’s wages. By 1887 he was superintendent of the Converse Cattle Company, moving the operation to Montana. And just four years after marrying Eula, John completed his purchase of the Converse Cattle Company and started expanding his holdings. But for the first few years of their marriage the new couple faced separation and adjustments. Although, Eula’s family moved often during her early years, she was raised to enjoy the finer things. John, not wanting his cultured wife to live in the rough bachelor digs of his mud-chinked log cabin sitting fifty miles from the nearest town sent Eula to live with her parents while he worked to improve the living conditions on his ranch in Montana. John expressed his loneliness for his young bride eloquently for an old cowboy used to solitude. Do you miss your old man? Not one half so much as I miss “the girl I left behind me.” Somehow the feeling of loneliness is inexplainable [sic]. Everything lacks interest: the scenes along the rode, the different views of snow peaks of the Big Horns, things that I used to enjoy so much. Eula, fed up with waiting after months of separation, wrote to her husband that she was moving to Montana, “even if she had to sleep on the floor and cook for herself.” John was thrilled with the “spirit of a true little wife and helpmate” she exhibited. For the next eighteen years the OW Ranch in southeastern Montana was their home. Although isolated, Eula had no time to be bored. She cooked, cleaned, ironed, sewed, did all the bookkeeping for the expanding Kendrick Cattle Company and after the birth of their daughter Rosa-Maye and son Manville she provided their education preparing Rosa-Maye for the seventh grade and Manville for the fifth. The children were taught reading, writing, math, science, and geography as well as how to swim, shoot, skate and ride. 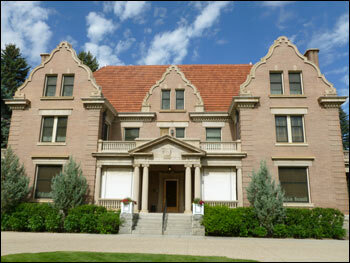 Wanting their children to have a formal education the Kendricks decided, in 1908, to build a house in Sheridan, Wyoming. Kendrick was already heavily involved in the Sheridan business community. In two years, Jack Kendrick, cowboy, became the honorable John B. Kendrick Wyoming State Senator. He then spent two years as the Governor of Wyoming before being elected to the U.S. Senate. Even as a U.S. Senator, Kendrick remained first and always a cattleman. He spent as much time as possible on the OW Ranch and championed the political causes of the cattleman. He was elected to two more terms and there was talk about a run to the White House. But John wanted to return to the West and enjoy his grandchildren and his homes in Montana and Wyoming, including Trail End. John Kendrick wasn’t destined for the White House or Trail End. On November, 3, 1933, Kendrick passed away after slipping into a coma two days earlier from a cerebral hemorrhage. Eula, who moved between ranch house and executive mansion with grace and extraordinary efficiency proved to be an excellent hostess and tireless worker beside her husband. In 1923, she served as the acting president of the Senatorial Women’s Club, a position traditionally held only by the wife of the Vice President of the United States. John’s death turned sixty-one-year-old, Eula’s life upside down. She withdrew from all positions outside the home. She lived for twenty-five years at Trail End with her son and his family fiercely guarding her husband’s political and personal memory. She passed away in San Antonio, Texas where she was living with her daughter, and is buried next to her husband in Sheridan Municipal Cemetery. Before he was finished, John Kendrick’s ranching empire grew to include over 210,000 acres of deeded and leased land in southern Montana and northern Wyoming. He and Eula had traveled extensively, raised two successful children, and served their state and country. But whatever they accomplished they did so together serving as each other’s greatest supporter and closest confidant. Their letters to each other make it clear their love is what they cherished most. If you would like to learn more about the Kendricks and read selections from their letters and the letters of their children you can visit www.trailend.org. If you are ever in the Sheridan area I highly recommend a visit to this beautiful home. Now it’s your turn to jaw for a bit. Refill your mug then speak up. If you’re a writer, do you like setting your story in a real place, or do you prefer designing your own? If you’re a reader, do you like reading a story set in a real place? How about incorporating historical figures in a story? The Kendricks appear in one of mine, do you include real people in your stories? Cookie! Stop lookin’ at me like that and get back to those beans! See ya all at our next stop on the trail! *The information and pictures of John Kendrick and Eula Kendrick were provided by Trail End State Historic Site.